Laconia, Lake Winnipesaukee's largest town, is also its business and commercial center, with Gilford right next door. Laconia (population 17,000), located 27 miles (43 km) north of Concord NH (map), is surrounded by lakes: Lake Winnipesaukee, Lake Opechee, Paugus Bay and Lake Winnisquam. It's the county seat of Belknap County (that's "bell-nap") and the largest town in New Hampshire's Lakes Region. Right next to it is the town of Gilford, home of Gunstock Mountain Ski Resort. Drop in to see the hydroelectric plant which ran the mill and supplied electricity to the town center from 1918 to mid-century. The mill now also serves as the region's center for culture and the arts. Laconia's Opechee Cove Beach in Opechee Park on Opechee Bay north of the town center (map) is the place for a swim. 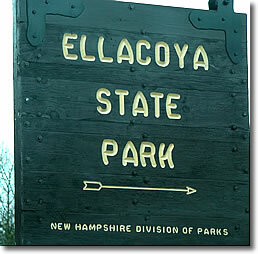 Ellacoya State Beach, on NH Route 11 in Gilford southeast of Glendale, is one of the nicest beaches on the lake. There's plenty of parking, and if you go early in the day you can get one of the picnic tables. There's a snack bar, and a lifeguard is on duty all the time the beach is open. The slope of the beach is very gradual, making it ideal for small children; for more experienced swimmers, a swimming dock floats in the water farther out.